The New York Times (15 August 2013) reports that scientist were able to observe (and film!) bacterial evolution in real time with predictable results. This article by Carl Zimmer is a nice example of science journalism, based on an original research article published in the open access journal Cell Reports. Bacterial evolution occurs quite rapidly and can be observed in the laboratory. While most previous research in this topic of experimental evolution was done with liquid cultures that do not require bacterial mobility; the researchers here cultured the bacterium P. aeruginosa (a dangerous pathogen in humans) in surface conditions that benefited bacterium mobility. 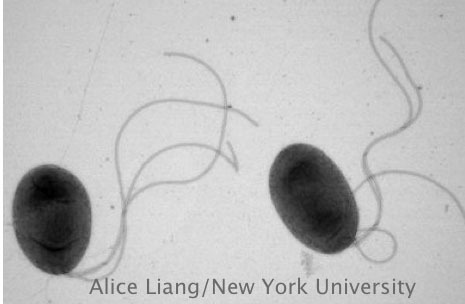 The bacterium counts with a single ‘swimming’ tail that acts as a propeller. The artificially created selective pressure resulted in the appearance ‘super swimmers’ in multiple independent experiments. These are bacteria displaying multiple tails. Strikingly, in all experiments, the ‘super swimmers’ resulted from mutations in a single gene that encodes for a master regulator of tail synthesis, even though they had evolved independently. This remarkable result indicates that there are few, sometimes unique, genetic/molecular paths to the evolution of a certain trait. Nevertheless, it was known previously that good swimming bacteria are bad at making biofilms, and the researchers provide some evidence that, in nature, a balanced selective pressure for both biofilm production and swimming may explain why the multi-tailed super swimmers do not appear to take over natural populations of this bacterium. Zimmers’ article is fun to read and described the results with remarkable accuracy and in terms easily understood by the general reader. Moreover, the text flows as a kind of detective’s tale by citing the researchers own experiences during the development of the study. This is quite useful since, while real-life laboratory research is not always fun, science should capitalize on the factors of adventure and investigation that make TV shows like “Crime Scene Investigation” so successful. There is another very good article about this research paper in El País from Spain. However, likely due to space restriction, this article in Spanish is much shorter and ends on a kind of negative note, stating that evolution in the laboratory is very different than in nature (as discussed, the researchers applied artificial selective pressure for only one trait, which explains this point). In contrast, Zimmer ends his article on a high, stating not only the scientific thrill to see evolution in action, but also that the findings could have medical implications for the treatment of P. aeruginosa infection, which rely on biofilm production. The latter statement could make this research appeal even to the hearts (while not necessarily the minds) of evolution deniers. However, both articles would have been improved by statements from an expert researcher not involved in the study; something that in my opinion should be a ‘must’ for science journalism. In summary, articles like these help raise the profile of science to the general public. For scientists, this highlights how original research, not only with interesting results but also with visual aesthetics, (the movies of spreading bacterial colonies are embedded in both online newspaper articles) appeal to science journalists.